If you live in the Heights you’ve seen the local magazine OurBlok. They offer insights into local business and rewards for shopping. OurBlok itself is in the news this week because they just suffered from cattle rustling. Their fiberglass mascot cow, Thunder, disappeared sometime over the weekend. 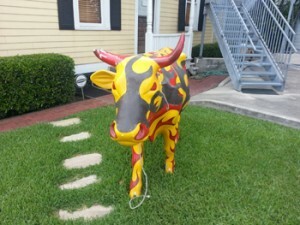 Scott Talley described the missing cow as cow-sized, bright yellow, with red and black flame-like spots. If the cow makes an appearance in your neighborhood, contact OurBlok. Hopefully it was a poor joke, and the cow will be back home on Center St.